Photo courtesy of Laurence Dickinson. The following picture-sets of Futurama and Grazioso guitars and basses have been sent to me over the years by their owners. The purpose of this page is to help me tidy-up and supplement the rather complicated FUTURAMA GUITAR STORY PAGE elsewhere on this website. Click on the underlined heading for each guitar to view photographs of that particular example. These are the first Czech solids brought into the UK by Selmer from about 1957/58. They were produced by the Dreokov company in Blatna, South Bohemia using the Trade Name Resonet, under the direction of a Mr Ruzicka. Selmer gave them the name of "Futurama Solid Guitar" in their catalogue. An example of the later rosewood fingerboard version. c1959 FUTURAMA/GRAZIOSO SOLID GUITAR (#492) - Owned by Clement Cachot-Coulom, UK. These are the second phase of Czech solids imported by Selmer into the UK from 1959. The Blatna Resonet company had ceased making musical instruments, so this role had been taken over by the CSHN company in Hradec Kralove, again under the guidance of Mr Ruzicka. CSHN initially used the trade name of "Neoton", but this was soon changed to "Jolana". The Jolana Star I two pickup solid guitar was traded as the Futurama II by Selmer. The Futurama III was actually called the Jolana Star II and later Star III in Czechoslovakia. Early 1960's FUTURAMA II SOLID GUITAR (# 1000) - A very unusual version, owned by Chris Barker in Spain. Early 1960's FUTURAMA II SOLID GUITAR (# 1191) - .....and another one, owned by Simon Jouneau in France. I just can't find out anything about this particular model. This particular guitar seems to be a transition model between the Grazioso and the Star II. It has the Grazioso type two-post vibrato unit fitted. 1959/60 FUTURAMA III SOLID GUITAR (#1329) - Owned by Kevin Benson, Yorkshire, England. In superb original condition. Still sporting the three-a-side headstock. c1961 FUTURAMA III SOLID GUITAR (# 247) - Owned by Gavin W. Semple, Oxfordshire, England. 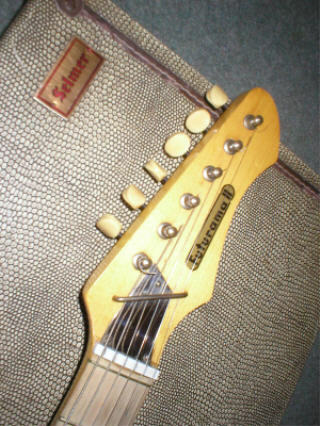 A 6-a-side "Tele" headstock example. This is another one with the later 6-a-side "Tele" headstock. These are the third and final distinct phase of Czeck solids distributed by Selmer under the Futurama label. They were again made at the CSHN Hradec Kralove factory, but both basic models had significant (and what look like cost saving) design changes.. By now, the trade name Jolana (model name: Star "#") was used in Czechoslovakia throughout this period. A maroon finish, with the "Tele" style headstock. Red finish with "pointed" headstock. Another red one with a "pointed" headstock. These guitars were basically the Hagstrom Kent with elements of the Hagstrom II and III models, simply re-badged and sold as Futurama's by Selmer in the UK. 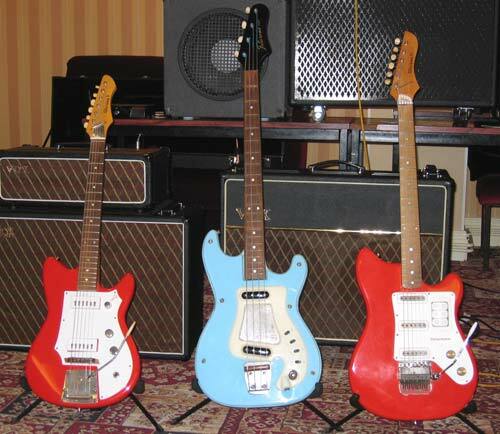 Solid red, and light blue finishes were offered, and the guitars were introduced into the Selmer catalogue in 1963. They were still there in the September 1965 catalogue. Both two and three pickup options were offered in 6 string guitar format, both with vibrato tailpieces, and also a bass guitar. The earlier (c1963) two pickup guitars had a perspex pickguard that covered the whole body front, with a very odd "cheesegrater" section built into the scratchplate between the pickups. The later (c1964) two and three pickup guitars seem to have had a smaller plain plastic scratchplate. In 1965, a different body shape similar to that of a Gibson SG replaced the Strat-shaped body of the previous guitars. A feature of these guitars was the "Kings Neck", with "expandable stretcher" - a steel truss rod enclosed within an aluminium sleeve. All-in-all, these were good quality guitars at a budget price. c1963 FUTURAMA 2 DELUXE (CHEESEGRATER SCRATCHPLATE VERSION) - Courtesy of Robert Wake, County Durham, England. c1963 FUTURAMA 2 DELUXE (CHEESEGRATER SCRATCHPLATE VERSION) - Courtesy of Grame Fletcher, UK. c1963 FUTURAMA DELUXE BASS GUITAR (PLAIN SCRATCHPLATE VERSION) - Courtesy of Guitars & Music Exchange, Manchester, England. c1964 FUTURAMA 3 DELUXE (PLAIN SCRATCHPLATE VERSION) - Courtesy of Neil Gill, UK. c1964 FUTURAMA 2 DELUXE (PLAIN SCRATCHPLATE VERSION) - Courtesy of John Walsh, Basingstoke, England. c1964 FUTURAMA 2 DELUXE (PLAIN SCRATCHPLATE VERSION) - Courtesy of Mick Price, Yorkshire, England. c1963 FUTURAMA DELUXE BASS GUITAR (CHEESEGRATER SCRATCHPLATE VERSION) - Courtesy of Ron Mellor, Cheshire, England. c1964 FUTURAMA DELUXE BASS GUITAR (PLAIN SCRATCHPLATE VERSION) - Courtesy of Guitars & Music Exchange, Manchester, England. More "up-market" than the Futurama Deluxe, the Coronados were again made in Sweden by Hagstrom. c1965 FUTURAMA CORONADO AUTOMATIC - Courtesy of Lloyd Metselaar, Peterborough, England. c1965 FUTURAMA CORONADO 6-STRING BASS - Courtesy of Mark Ringer, England. Return to HOFNER GUITAR MISCELLANY INDEX PAGE.